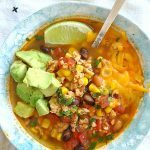 This Instant Pot Turkey Taco Soup is healthy and fresh-tasting and as simple to make as opening a few cans. What’s the difference between taco soup and chili? The seasoning. A chili has chili powder in it. 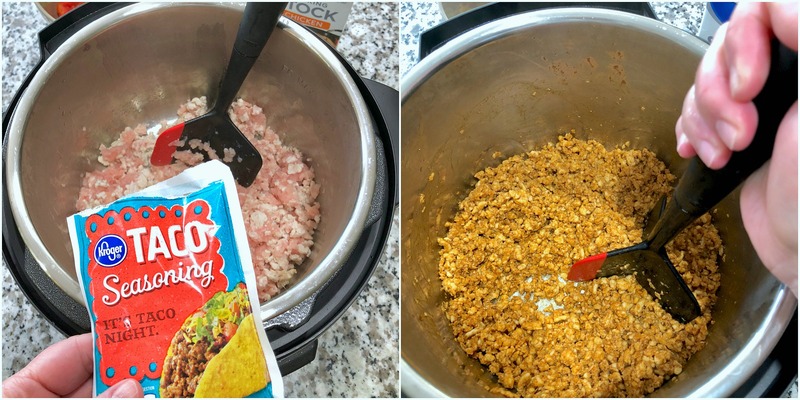 A taco soup has taco seasoning in it. 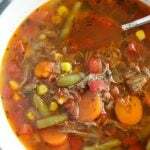 I have several chili recipes on the blog but so far only one taco-style soup. 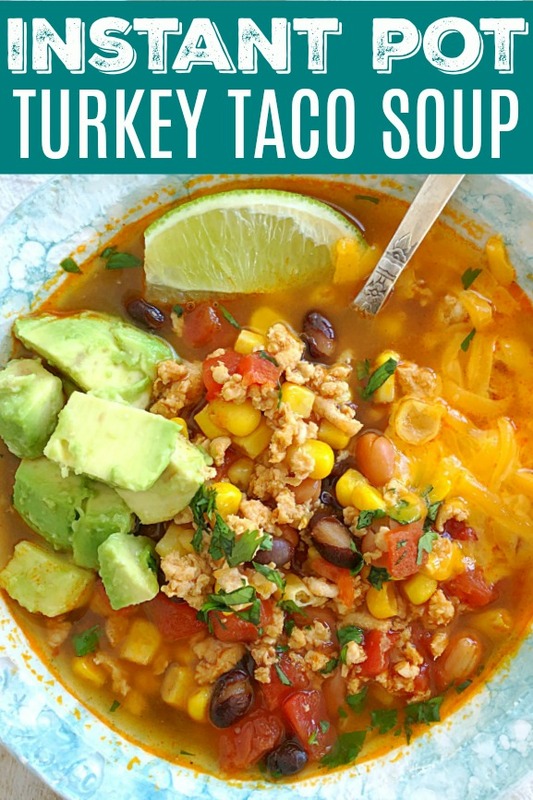 So I decided to create this Instant Pot Turkey Taco Soup to be a healthier and even simpler version of the taco soup recipe I have shared previously. I’ve mentioned before that our family really loves Mexican-style food. 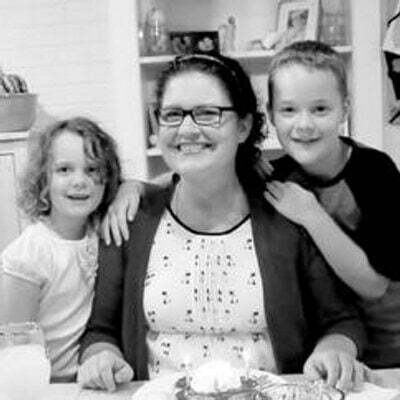 My kids would eat taco or burrito “something” every night of the week if they could. So this soup recipe made them happy. And it made me happy because since I’m still trying to eat less carbs in my overall diet, soups are a terrific way to do that. The kids ate some chips and guacamole with their soup for dinner, and I just skipped the chips. I have to talk about this meat chopper tool. This is not a sponsored post in any way but OXO sent me this gadget a while back and I just love it. 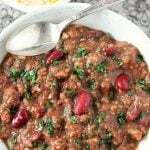 It’s so easy to break up ground meat as it’s cooking and then it can be used to scrape and stir too. If you’re looking for a stocking stuffer for the cook in your life, it’s a great option! Use your favorite taco seasoning in this recipe. I usually buy the brand that is the cheapest (or on sale at the time). Use your favorite salsa as well. I splurge on salsa and this is the brand I use in this soup. 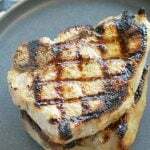 Find the OXO Meat Chopper here. While the soup is cooking in the Instant Pot, you have plenty of time to prepare toppings – I like chopped avocado, lime wedges, shredded cheddar cheese, fresh chopped cilantro and sour cream. Set your Instant Pot to "Saute". Add butter to melt. Add the ground turkey and cook until no longer pink, using a meat chopper or spoon to break up the meat as it cooks. Stir in the taco seasoning and smoked paprika. Add the chicken broth, all the canned ingredients (both beans, corn and tomatoes) and salsa. Stir well to combine. Put the lid on your instant pot with the seal set in the middle to "Sealing". Use the manual setting and set the time for 5 minutes. 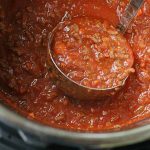 Allow the instant pot to get to pressure then it will count down the five minutes. I allow my instant pot to release pressure on its own. But you can manually release it if you prefer. 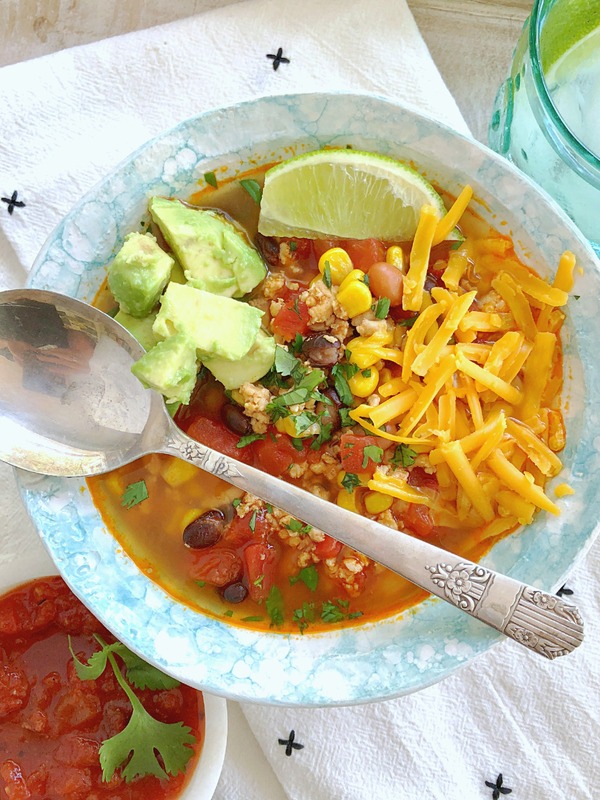 Top the bowls of soup with chopped avocado, chopped cilantro (optional - not everyone likes cilantro), shredded cheddar cheese, sour cream and a lime wedge. 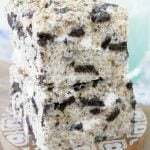 I’m going to make this this weekend!!! yum!!! lunches for work! Yum! I have ground turkey in the freezer and wasn’t sure what I was going to do with it, but I know now! 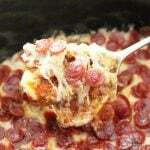 This recipe has everything I love!! So happy to hear this. Enjoy! I’ve just bought my InstantPot and looking for some delicious recipes to try! 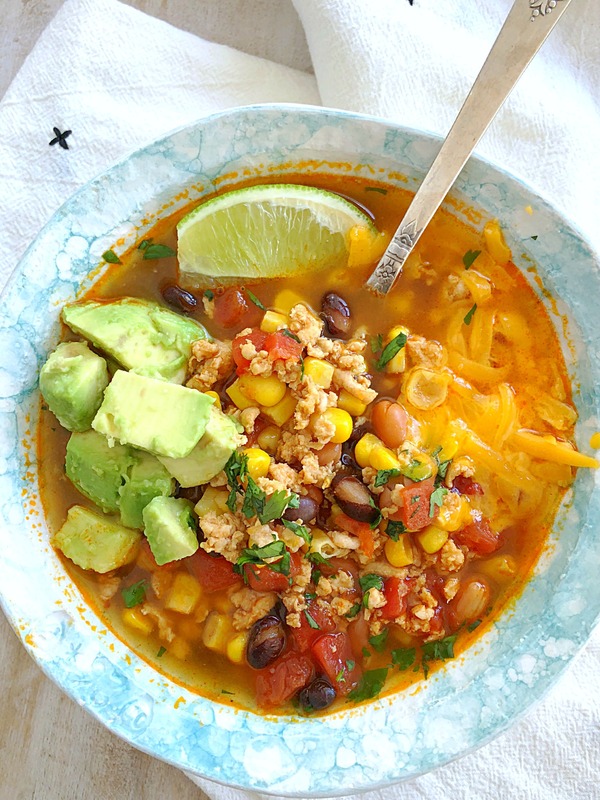 This turkey taco soup is definitely on my to cook list! Wonderful. I hope you enjoy this soup! It will be a while before the weather cools off here in Florida! I’ll be tucking this away in the “to try” file! Glad to hear this. Thanks! I WANT and instant pot!!! It’s going on my Christmas list! This recipe looks super yummy! I am enjoying mine. It doesn’t replace my slow cooker but I really like the quick convenience of having it around. I’ll be creating more recipes for it in the future! Yum. This sounds sooo good and thanks for clarifying the difference between the soup and chili. 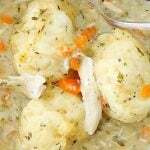 Can’t wait to try this for an easy yummy comforting dinner. Thank you Stephanie. I think you’ll enjoy this taco soup! 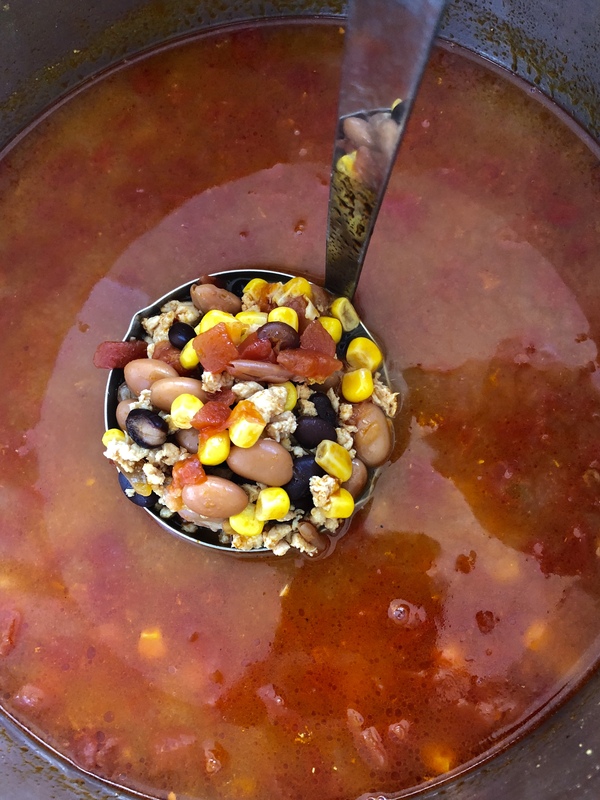 Ooh, I love this easy-peasy turkey taco soup! Plus I JUST bought an instant pot, no kidding! I haven’t even made one recipe in it, so I guess this gives me the perfect excuse to try it! Awesome! Sometimes I feel like everyone was using the Instant Pot before me, but I still know lots of people just getting one to try. Still a lot of untapped potential! This sounds like a delicious dinner idea. I still haven’t bought an Instant Pot and every time I see great recipes for it, I want one!! Have to treat myself soon! Great! Come back and let us know what you think. Keep the instant pot recipes coming! These are perfect for busy weeknights. And who doesn’t love taco soup? I will keep them coming. I’m still a newbie with my Instant Pot but I’m really learning to like it! I don’t know why i’m not eating this right now. 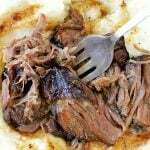 So simple int he instant pot and the ingredients all sound delicious. 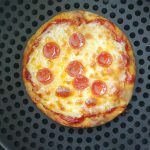 Perfect easy weeknight meal! 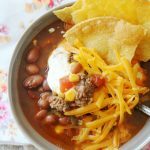 I love a good taco soup recipe! 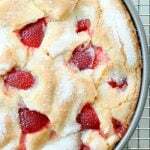 And I love that this one is made in the instant pot!